I’ve spent so much time eating tacos in Mexico but here’s a great wish list for the best tacos in LA. 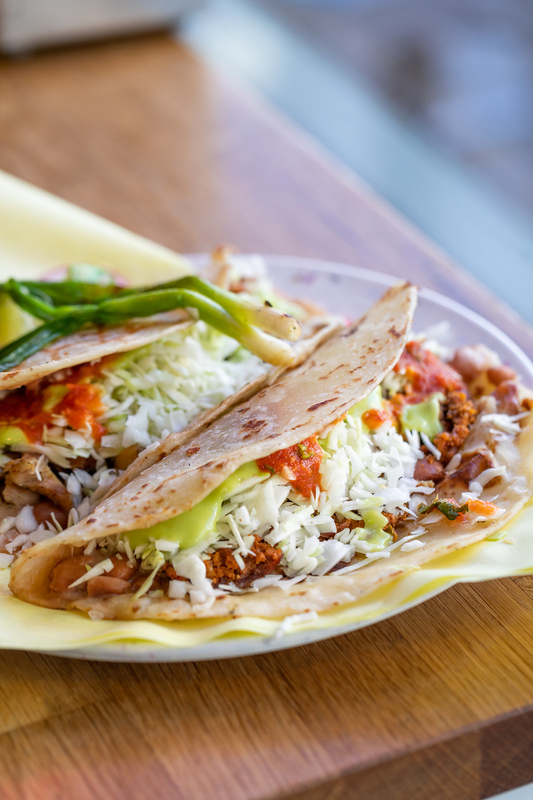 It’s no secret that Los Angeles is home to some of the best tacos north of Mexico. With a rich culture inspired by its southern neighbours, Los Angeles prides itself on a unique culinary scene unlike anywhere else. 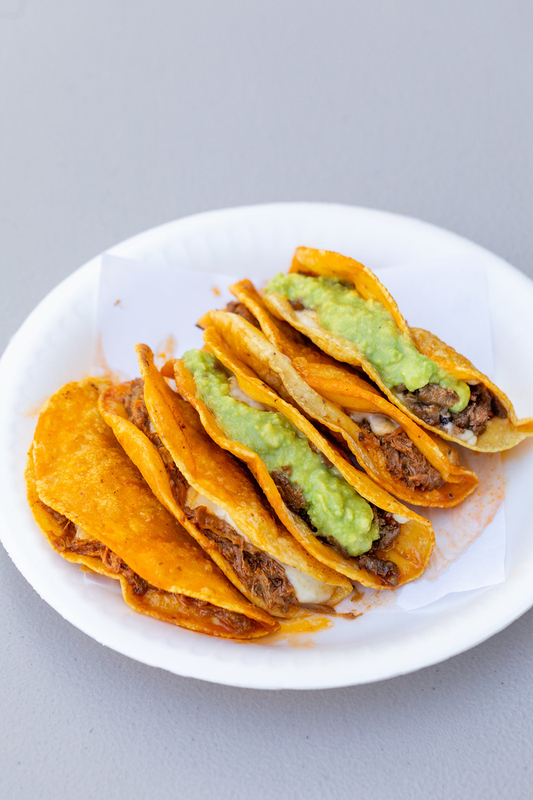 One thing is for sure: Tacos are king in Los Angeles. In fact, there are over 4000 registered loncheras aka tacos trucks in Los Angeles. With a burning desire to show off what the City of Angels has to offer, dineL.A. has come up with a Taco Trek worthy of any taco connoisseur. 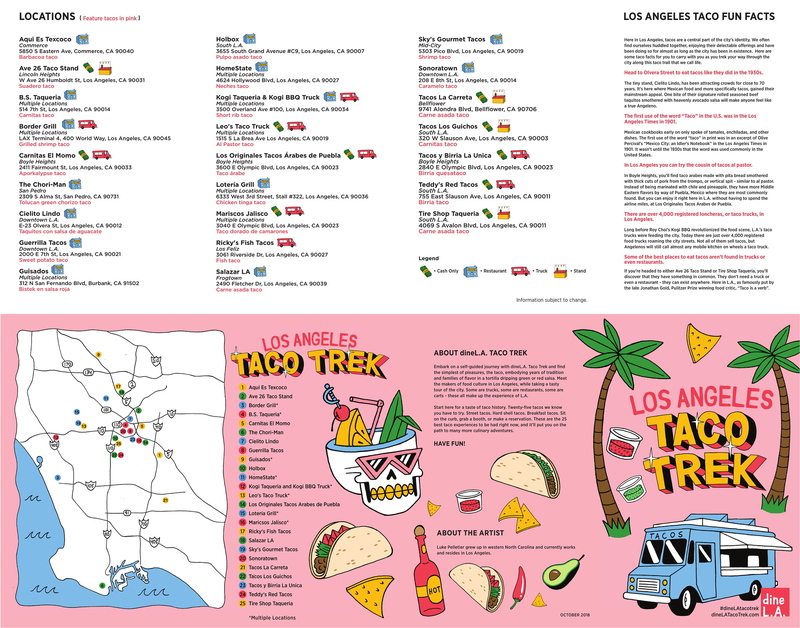 Its map is designed by artist Luke Pelletier detailing all the best tacos in LA, participants can trek across the city in search of their favourite taco. Want the Best Tacos in LA Map? At B.S. Taqueria, Chef Ray Garcia puts a spin on authentic Mexican fare. Offering organic handmade tortillas filled with a variety of proteins, pork is still the focus with carnitas tacos to die for. Meat not your thing? Vegetarian options are also available with cauliflower al pastor tacos to satisfy those cravings. This low-key taqueria in Southeast Los Angeles serves up barbacoa (lamb barbeque) like no other. 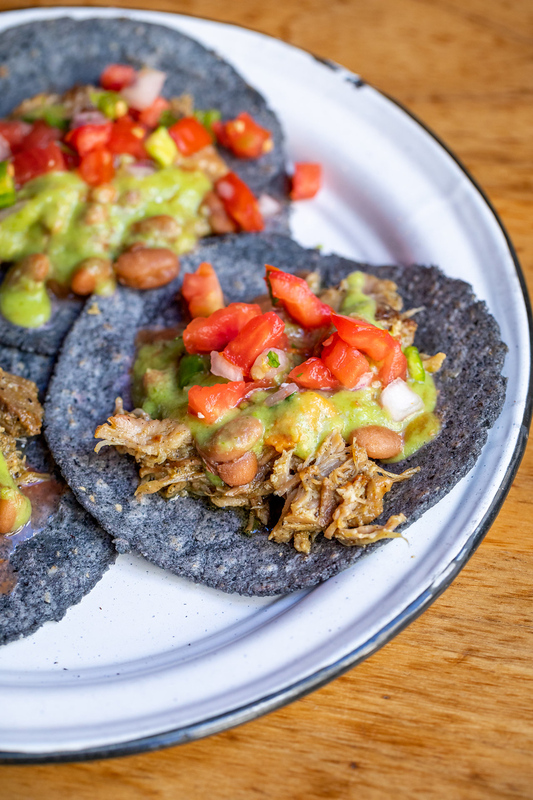 Inspired by the region of Texcoco, a rural area 15 miles east of Mexico City where barbacoa is rumoured to have gotten its start, this taco joint is guaranteed to have your taste buds eager for more. No matter what you order, this popular taco stand in Lincoln Heights has you covered for all your taco cravings. Top your taco with all sorts of delicious fixings, including grilled seasoned onions, red or green salsa or–if you ask for it–a halved baby potato that’s been simmering in a pot of meat drippings. Considered the home to some of the best tacos in LA, this Mexican restaurant has been around since 1990, and for good reason. Chefs Mary Sue Milliken and Susan Feniger, Bravo’s “Top Chef Masters” and Food Network’s “Too Hot Tamales” present the bold foods and flavors of Mexico with décor as wild and bright as a fiesta. 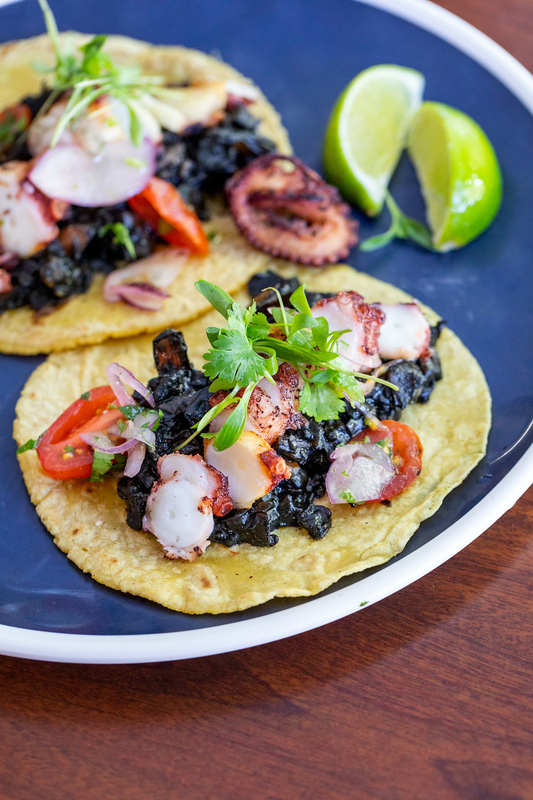 Ranked among LA Times’ top restaurants and named “One of the Best Restaurants in America” by Gourmet, this popular spot will have you dreaming of tacos for days. The folks at Carnitas El Momo have perfected the slow, flavour-inducing carnitas method. Cooking chopped pork low and slow in seasoned fat to intense tenderization, this truck offers the ultimate in carnitas indulgence. Choose from maciza (shoulder), cuero (skin) or buche (stomach), or opt for all three with the Aporkalypse. A veteran in the American taco world, Cielito Lindo has been serving up delicious Mexican fare since 1934. Taquitos are the real star though, rolled beef is smothered in green avocado salsa to get your taste buds excited. Cielito Lindo is a blast from the past fused with modern-day taco obsession. 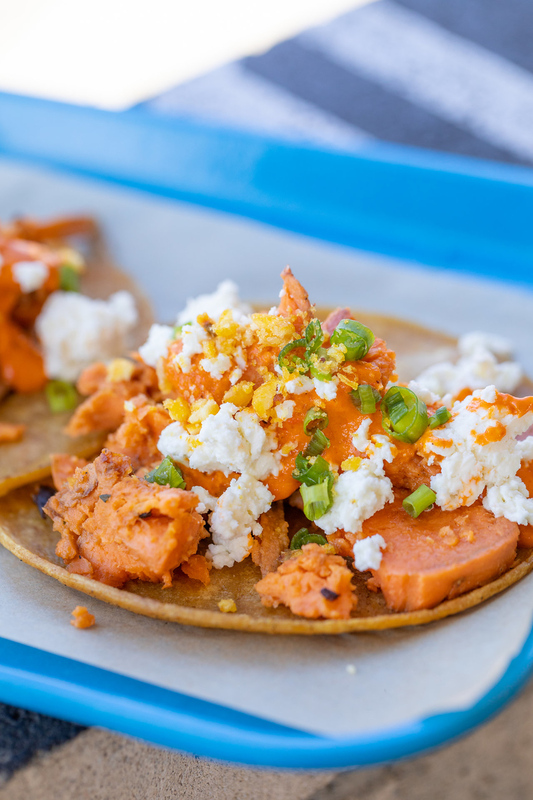 The ever-changing menu at Guerilla Tacos is based on what’s fresh and available, and what new ideas owner Wes Avila has cooked up. With a mission to make gourmet food available on the street, the Guerrilla Taco truck brought world-class dishes to the streets of L.A. Though the truck has since been retired, Avila’s brand-new brick and mortar store is thriving. Born in Boyle Heights in December 2010, Guisados was created with a simple menu reminding the owners of home. The best tacos in LA are often the simplest. Here at Guisados they try to put this love and feeling in every bite. The bonus? You don’t have to choose what taco you want! Offering a sampler with 6 mini versions of your favourite tacos, you can try the whole range. Order the sampler with a side of a seafood taco (not included) for an unreal experience. At Holbox, Chef Gilbert Cetina has tapped into Mexican and Los Angeles culture to create some of the most exciting mariscos (seafood) in the city. With an array of seafood options available, including oysters bathed in lime juice and chiles and octopus tacos on handmade tortillas, guests can get their fill of the sea. In San Pedro, The Chori-Man has chorizo down to an art. With different styles of chorizo to choose from, guests can try any number of delicious offerings to get the perfect punch to your savory senses. 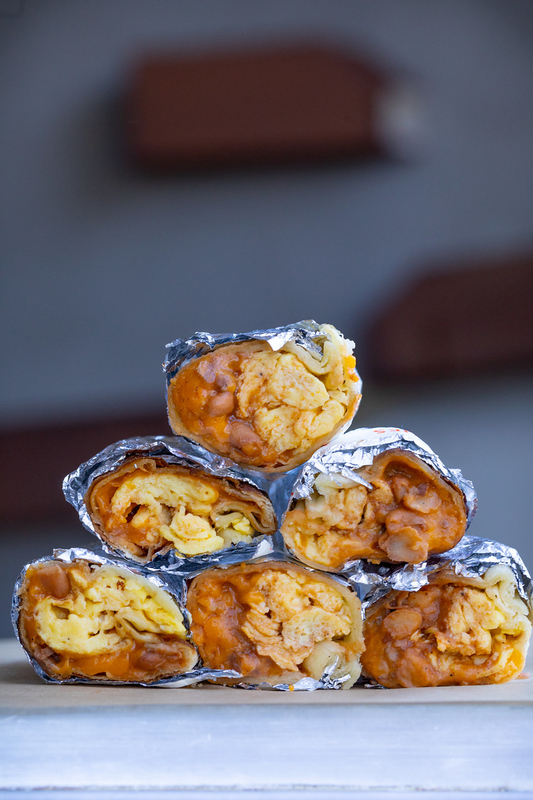 Beginning as a small storefront in Los Feliz, Homestate offers unconventional breakfast tacos. Homestate does one thing, and one thing only: Texas food, deep in the heart of LA.But hey who says the best tacos in LA can’t come from Texas? With locations in Los Feliz and, more recently, Highland Park, taco-fiends can get the best breakfast tacos in L.A. at Homestate. Inspired by the rich offerings of the sea, Mariscos Jalisco specializes in seafood delicacies all wrapped up in taco form. With two spots in Boyle Heights and Downtown L.A., guests flock to this popular spot for its shrimp tacos. 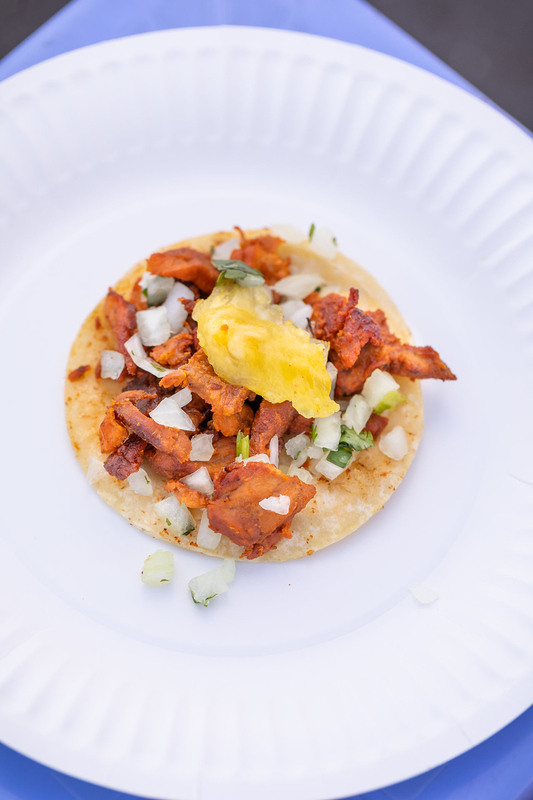 Al pastor is king at this food truck. 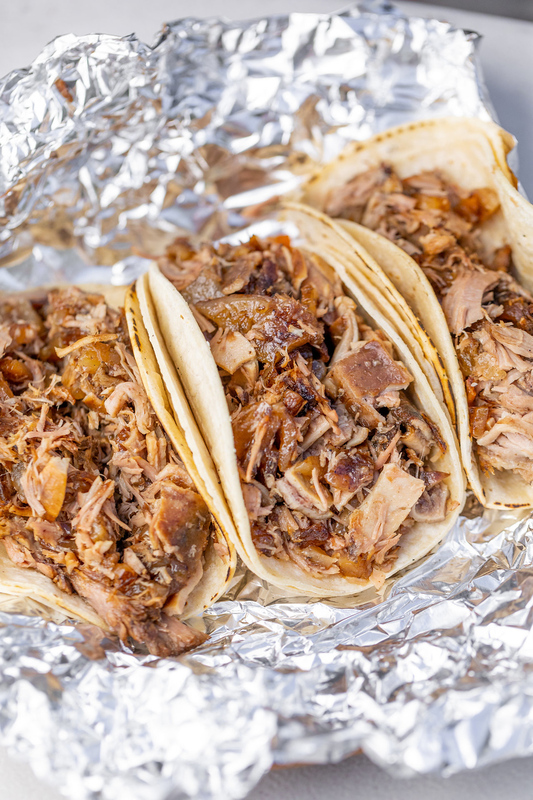 Serving up spit-roasted marinated pork, sliced and tossed into delicious tortillas, Leo’s Tacos lets the protein be the star. Top off your tacos with a chunk of pineapple and a range of sauces at the salsa bar. A taco arabe is similar to al pastor and often called its cousin. It is spit-roasted pork served up on a pita-tortilla hybrid. Tacos arabes are most often found in Puebla and Mexico City, where Lebanese immigrants brought their way of cooking to Mexico. Today, you can find both tacos arabes and tacos al pastor cooked on the spit, or trompa as it’s called in Mexico. 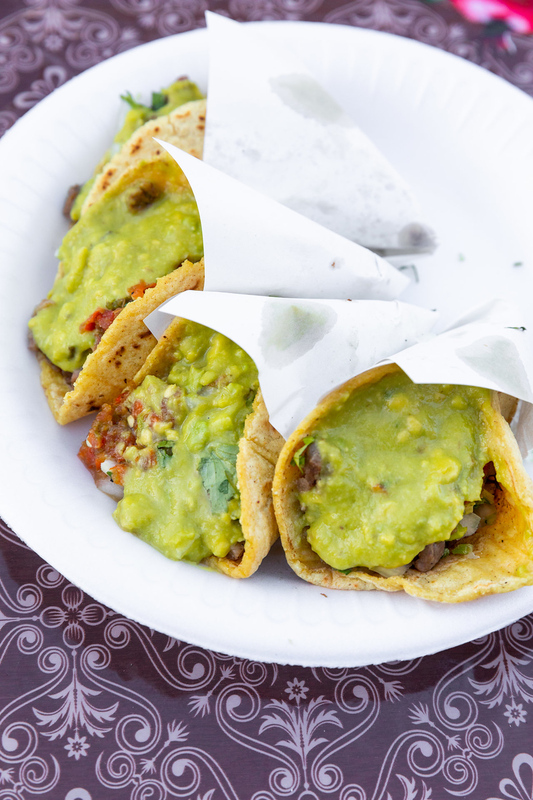 This taco truck dives into the deepest regional taco variations available in Mexico, giving the people of Los Angeles a taste of Mexico’s rich food culture. You cannot make a pilgrimage to the city without sampling these as they are some of the best tacos in LA. Fusion reaches a whole new level at Loteria Grill, brought to Mexico’s food scene in 2004. 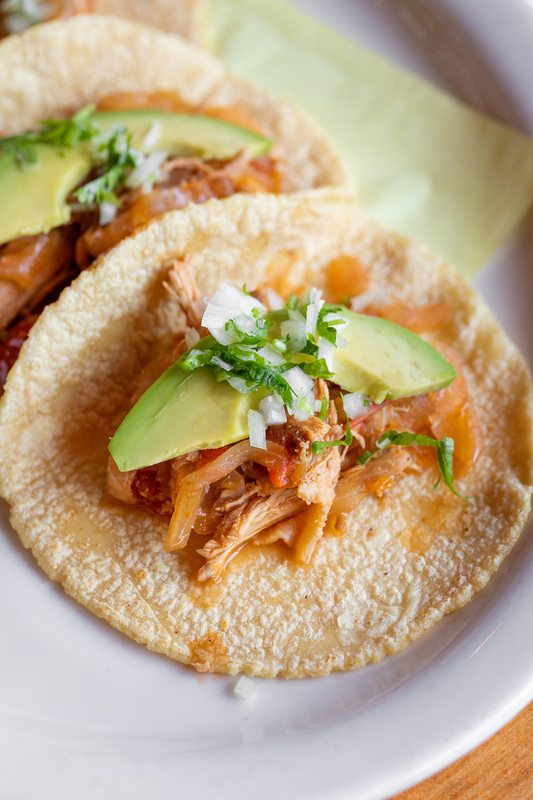 Chicken tinga, which originated in Puebla, is the star at this spot. Chef Jimmy Shaw combines Mexican authenticity with Indian flare for the perfect party for your tastebuds. This modern taco spot has a range of proteins to take care of all your taco needs. House-made flour tortillas and delicious carne asada and pollo asado will have you singing your praises. With sides such as Frijoles Puercos and Esquites, guests are sure to leave with full bellies. 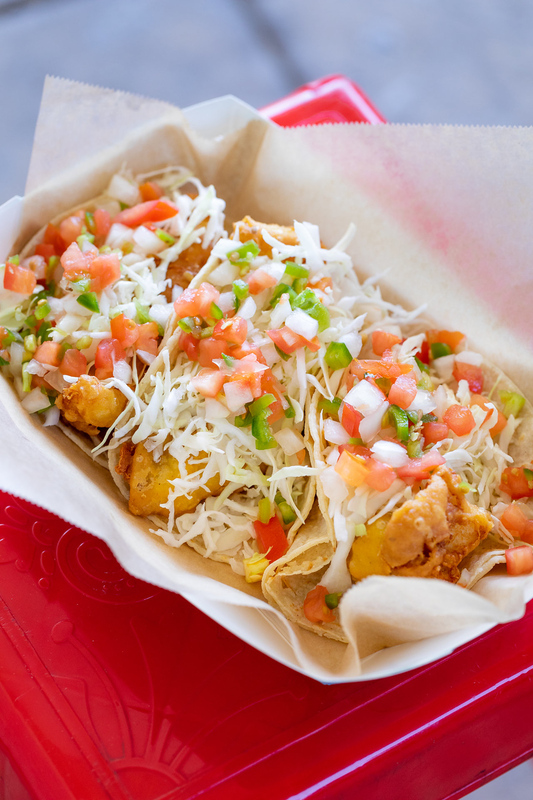 Fish tacos reign at Ricky’s, with beautifully battered fish and shrimp as the stars. With thick, full-bodied salsas and hard-to-resist baja fish, there’s no excuse not to stop by for a bite. Offering a mix of Korean and Mexican fusion, Chef Roy Choi has changed the Southern California taco game. Short rib tacos, Korean BBQ and more are what guests can expect. Open for a decade, this popular taco joint is the place to be for a new taste experience. Sky’s Gourmet Tacos offers the finest quality Mexican food – with a splash of soul – to communities throughout Southern California. Featuring unique tacos that divert from standard Mexican tacos, Sky’s Gourmet Tacos hits the mark when it comes to out-of-this-world Mexican fare. Downtown Los Angeles is home to award-winning tacos and divine agua frescas. This small taco spot serves some of the best tacos in LA and lets you order at the counter. It is a refreshing change from the big restaurant scene. Serving up northern Mexican fare, Sonoratown is a must-visit for any carne asada lover. The smell of charred beef dominates this Bellflower spot. Offering Sinaloa-style mesquite-grilled carne asada, Tacos La Carreta is as authentic as it gets. With owner Jose Morales serving up food inspired by his hometown of Mazatlán, Sinaloa, guests can expect a beautifully simple taco experience. This South Los Angeles food truck features picnic tables to enjoy your delicious carnitas. With extra spicy habanero salsa and a nearby churro vendor, guests are all set to enjoy a Mexican feast at this parking lot spot. Made famous by Chrissy Teigen and John Legend who enjoyed a dinner catered by this popular taco joint, Tacos y Birria La Unica has hit the mark on Michoacán-style birria. They offer up a number of proteins including goat, but it’s the handmade tortillas dipped in fire-red broth and grilled to perfection that make them so unique. Birria is the focus at Teddy’s. This South Los Angeles spot cooks only beef birria, on offer along with a deluxe plate complete with a quesadilla, molita, tostada, taco, pozole and chips and salsa, all for $10. If you’re looking to fill up on a delicious Mexican classic, this is the spot. Serving up Tijuana-style asada, Tire Shop Taqueria offers marinated-to-perfection meat in a warm handmade tortilla topped with cool avocado salsa. 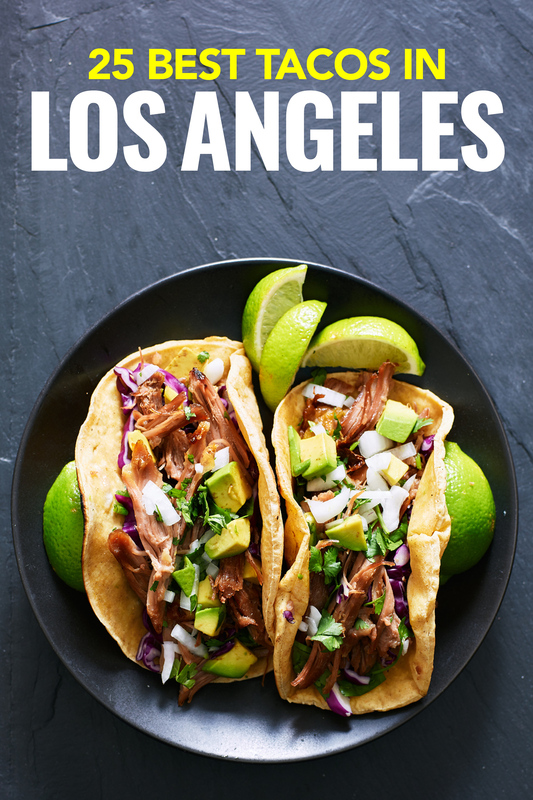 This was a guest post from PUNCH Canada, which I wholeheartedly welcomed as I adore tacos in Mexico but I’ve never eaten tacos in LA and now I have a wish list for when I go!